newsR > India News > Avengers: Endgame actors Jeremy Renner and Paul Rudd have the most amusing way to avoid giving spoilers! Avengers: Endgame actors Jeremy Renner and Paul Rudd have the most amusing way to avoid giving spoilers! 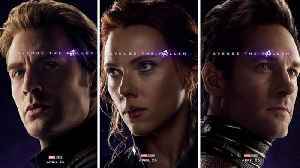 Comicbook.com reports 'Avengers: Endgame' is nearly here, and fans are trying to not hear spoilers. But TV spots are teasing fun things to expect without giving it all away. A recent spot..
Jeremy Renner is on the purple carpet at the premiere of 'Avengers: Endgame'. Listen in. 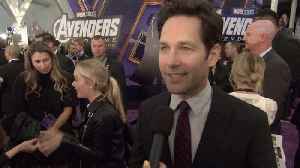 Paul Rudd is on the purple carpet at the premiere of 'Avengers: Endgame'. Listen in. 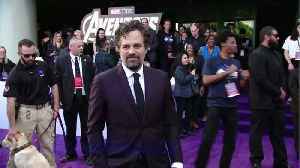 Mark Ruffalo Got a 'Dummy Script' for 'Avengers: Endgame' The actor plays Bruce Banner and his alter-ego, The Hulk, in the Marvel Cinematic Universe films. 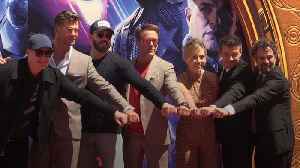 He recently admitted that in order to..
Stars of Avengers: Endgame received one of Hollywood’s highest honours when they placed their hands in cement outside the historic TCL Chinese Theatre. Chris Hemsworth, Jeremy Renner, and Danai Gurira, who play Thor, Hawkeye, and Okoye in Avengers: Endgame, answer fan questions about the movie. Avengers: Endgame is in theaters everywhere April 26. 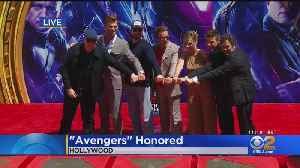 Robert Downey Jr., Chris Evans, Mark Ruffalo, Chris Hemsworth, Scarlett Johansson and Jeremy Renner were honored in Hollywood. Tina Patel reports. Russo Brothers also wrote a letter, posted on their Twitter account, requesting Avengers: Endgame fans to not give out spoilers when they watch the film.